​Whether you are shifting to a new place or renovating your house, purchasing kitchen materials is always a hassle. Since there are so much diversity in cooking materials, you will always end up forgetting some essential tools. So we have made a list of the top 15 kitchen tools that you should not miss. It is really handy for cutting non-veg foods such as fish and meat into small pieces. More so, you can use it while opening up new packages or trimming the crust of a pie. You will be amazed to find out the usefulness of a kitchen shear as it serves multiple purposes. Some models include sharpening and cleaning blades for the comfort of your use. It is a necessary tool for cutting the outer skin of vegetables. An ideal vegetable peeler will have long, easy to grip handle and narrow blade. Chef’s knife is made specifically to use in the kitchen. It can withstand extreme temperature and offers protection from rust or oil. You can precisely cut vegetables as well as non-veg items with a chef’s knife. You need a base for cutting your items safely and accurately. Cutting board is a perfect tool for this purpose. You may need multiple boards of various sizes. It is better to purchase cutting boards made of bamboo. Bamboo is naturally antibacterial, so you can feel protected from viral diseases. Because viral or bacterial diseases often spread from the plastic material, especially when you leave the board uncleansed. But even if you forget to clean your board made of bamboo, it will neutralize the bacteria and provide food safety. A turner tool is necessary for flipping and tossing items during cooking. You can easily flip eggs, pancakes or patties with a spatula. You can cook a wide range of food in your skillet. It is essential for frying and tossing the food item. You will do most of your cooking in a frying pan. So, it is better to buy several pans including nonstick and stainless steel variety. Nonstick pan is handy for cooking light food items such as eggs, pancakes etc. But, You must turn to stainless steel or cast iron skillet for cooking steaks. This item is helpful for the pre-cooking session. In the art of cooking, often you have to mix up ingredients in the right order before turning the stoves on. Having a few mixing bowls is mandatory for every cook. Measuring cups and spoons have become very common kitchen items in this age. Nowadays, people are more concerned about their health. These items with measuring scale will give you the exact calculation of the ingredients rather than an approximation. If you are new to cooking, you will feel comfortable as you can take the exact amount of ingredients mentioned in your cooking book. Furthermore, you will know how much to cook when you have guests. Many people regard this as a crucial item to have in the kitchen. It is a better substitute of micro pane as you can shred or slice vegetables, fruits or even cheese with superior precision. Washing the food item before cooking is an essential task. A colander will help you to rinse and strain excess water from vegetables, meat or boiled food. If you like to eat salad regularly, a colander will work as a salad spinner. Cake lovers won’t miss this item in their kitchen. You can bake cakes, prepare pizza or light dinner in this pan. It is easy to clean, and you can also serve your food in it. It is amusing to cook with it as it distributes heat well. You can cook either rice, soup, pasta or boil eggs with it. As it comes with a stainless steel handle, it is safe to use. In cooking, you often need to mix up different ingredients. A whisk is very convenient for this task. The wires of the whisk are evenly distributed to blend different types of component smoothly. It comes in various shapes, but you should choose the mid-sized one with a narrow handle. The reason is, it is easy to grip and blends precisely. A dutch oven made of cast iron is the perfect tool for slow cooking. It provides the slow transfer of heat for hours with little evaporation, thanks to the thick surface. So, you can preserve your food in it for hours. Moreover, it will complement your saucepan when you have multiple items to cook. You can’t imagine a kitchen without those boxes. They are a lifesaver when it comes to keeping your food in a safe place. You can keep them in your refrigerator, microwave, and oven or in anywhere else. They are easy to wash and you can take them to carry food in your office. 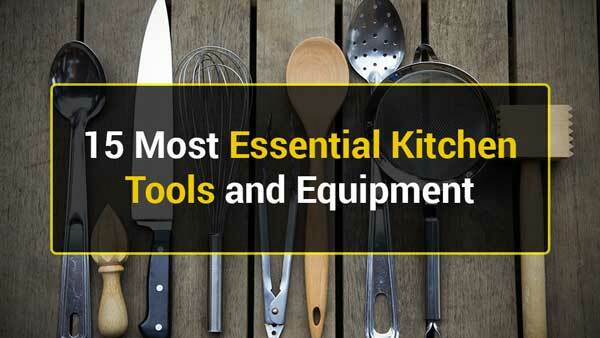 We have ranked only the items that are basic for every kitchen. You may end up buying plenty of other expensive equipment for your kitchen later. However, we suggest that you should start with the basic items first. You may buy other equipment later as per your need. But, it will be wise for the beginners to use this article as a checklist of the kitchen items that they should never miss.